Model Masuimi Max is about 1.69m and wears a size S.
Pictures by Laura Byrnes copyright. The 50s Evelyn swing dress in red satin with matching bolero by Pinup Couture The Evelyn is a classic retro inspired party dress with a gathered bust, full skirt, and removable shrug. 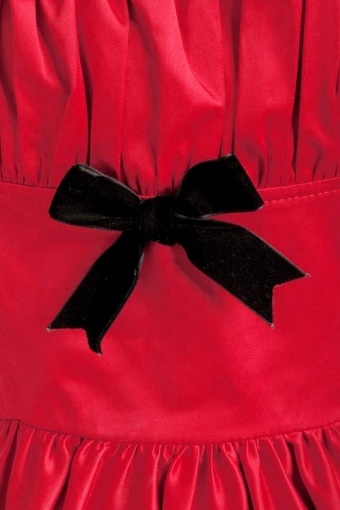 In this warm red tone and shining satin fabric (slightly stretchy), it is absolutely perfect for a party or wedding! The shrug is reversible with rich black velvet on one side and matching satin on the other. The peasant style bodice flatters a range of bust sizes, has a slimming fit through the waist, and then opens up in a full vintage style skirt. For more drama it can be worn with a petticoat, but it's not necessary. Stunning! Also available in Vintage Floral Yellow & Black!